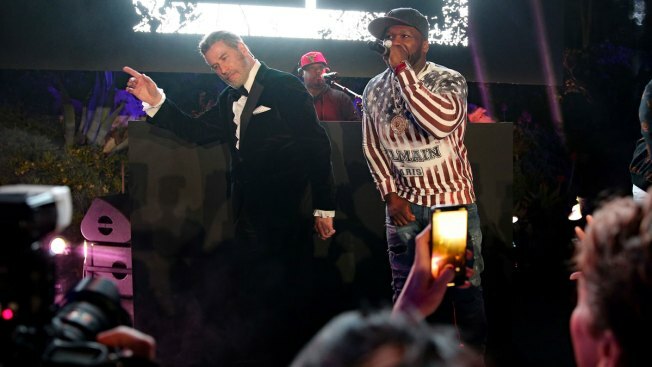 John Travolta and Singer 50 Cent ( Curtis James Jackson III ) on stage during the party in Honour of John Travolta's receipt of the Inaugural Variety Cinema Icon Award during the 71st annual Cannes Film Festival at Hotel du Cap-Eden-Roc on May 15, 2018 in Cap d'Antibes, France. Travolta loves Cannes. It's where Quentin Tarantino's "Pulp Fiction" debuted two decades ago and won the festival's top award, the Palme d'Or. This year's trip is more of a victory lap while premiering "Gotti."